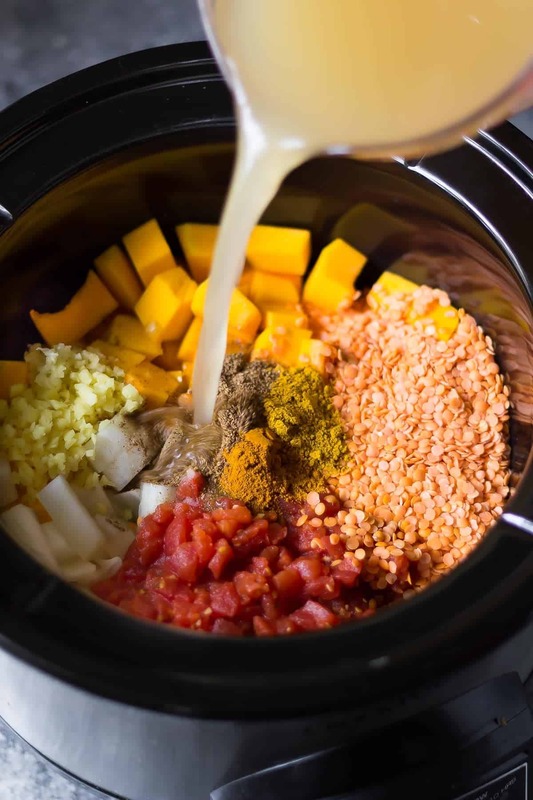 This slow cooker butternut squash lentil curry is the healthiest comfort food you can find. Plus it’s packed full of protein to keep you full! Did I ever tell you guys that I went on a once of a lifetime trip when I was just 15 years old? As part of a school trip, 20 or so of us visited Nepal for a month, visiting Kathmandu and trekking through Annapurna. We fundraised for over 2 years to contribute money to a charity that builds schools and water systems in rural parts of Nepal, and then got to go visit and meet the people who live there. Now that I think back on it, I can’t imagine sending a 15-year old to Nepal, let alone a whole bunch of us with a few adults. It seems crazy! This was back when Nepal was much more politically stable, but still. That’s a very different environment than Canada. Well visiting Nepal taught me to never take what I have for granted, because I had never seen what poverty really looked like until that trip. I definitely had a new perspective on how fortunate I am to grow up in a country like Canada when I returned home from Nepal. PS- I just had to dig out my photo album and post a couple of photos. This is from 1999!! What an awesome trip that was. I’d love to go back someday! PPS- I was feeling soooo sick in that second photo but we had to hike that day. Hence the sad face. That trip also taught me to be more adventurous with my eating. And one of my favorite recipes from the whole trip was dal. Or dahl? Or daal? 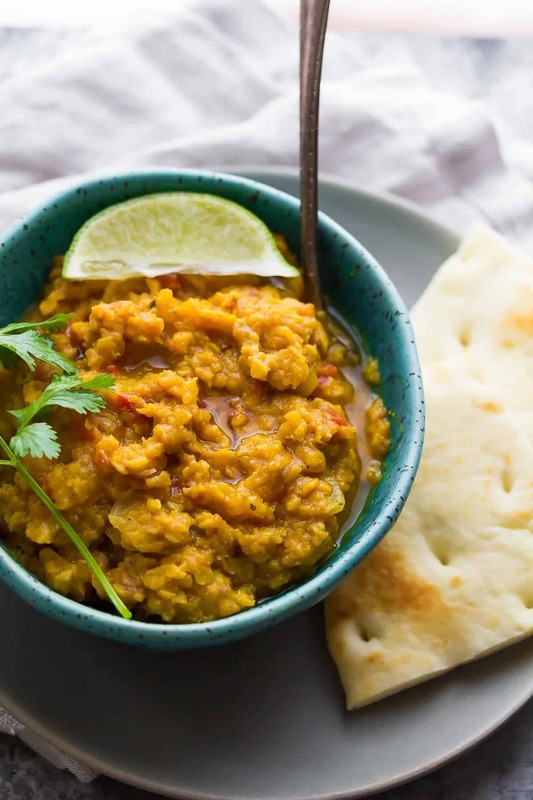 So today I’m paying homage to Nepal with my twist on dal with this slow cooker butternut squash lentil curry. Of course I couldn’t go straight up traditional dal, could I? I thought the flavors would be awesome with some butternut squash and, I was totally right! 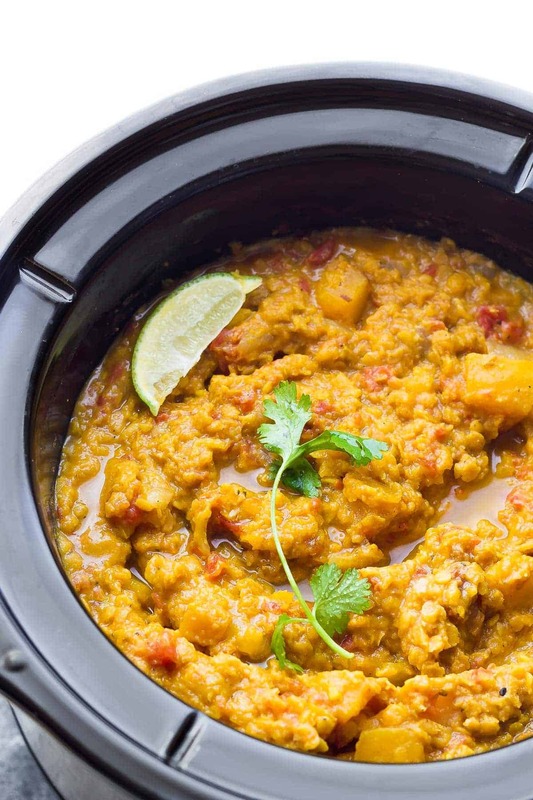 The best part about this slow cooker butternut squash lentil curry is how easy it is to make. 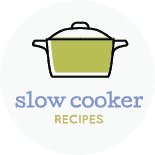 It’s another one of my dump and go slow cooker recipes. You really just dump all the ingredients into the crock pot, give it a stir, and walk away. And it’s also great because you can cook it up to 8 hours (I haven’t tried any longer than that), and it will be creamy perfection when you are done your day. This slow cooker butternut squash lentil curry is vegan but TOTALLY filling. Ben is slowly coming around to the fact that vegetarian (and even vegan) food can still be completely satisfying. He loved this one! I like serving mine with some naan bread wedges and a salad. This post has made my heart happy. I feel the older I get, the more I love nostalgia, and one of the best ways to revisit a memory is through food. I’d love to hear if you have any travel memories that you revisit through food? Leave me a comment or shoot me an e-mail, I’d love to hear! 9/2017: this post has been updated with instructions to assemble ahead and freeze for an easy freezer slow cooker meal. 10/2018: this recipe was retested and spices adjusted for a more flavorful curry. This slow cooker butternut squash lentil curry is the healthiest comfort food you can find. Plus it's packed full of protein to keep you full! Combine all ingredients in the base of a 5 quart slow cooker and cook low 8 for hours. Add salt & lime, adjust to taste. Mash everything up with a potato masher or serve as is. Combine all ingredients except for the coconut milk and stock in a gallon-sized freezer bag. Remove as much air as possible. This looks amazing, but I’m allergic to coconut. What do you recommend as a substitute? Would normal cows milk work? I really want to try this! Hi Sarah! I’m not sure about a coconut milk sub. Maybe you could add cream or milk, but be sure to only add it at the end of cooking otherwise it may break. Hope you enjoy! I followed the directions as they were printed. The curry dish was dry after cooking there was no liquid in it. Is this normal? Hi Andrea, I’m so sorry to hear this! I just made this recipe a few weeks ago and didn’t have this problem. Did you add the full 3 cups of stock? It really shouldn’t be dry. I do give it a good mash with a potato masher before serving and have added that step to the directions to be more clear. 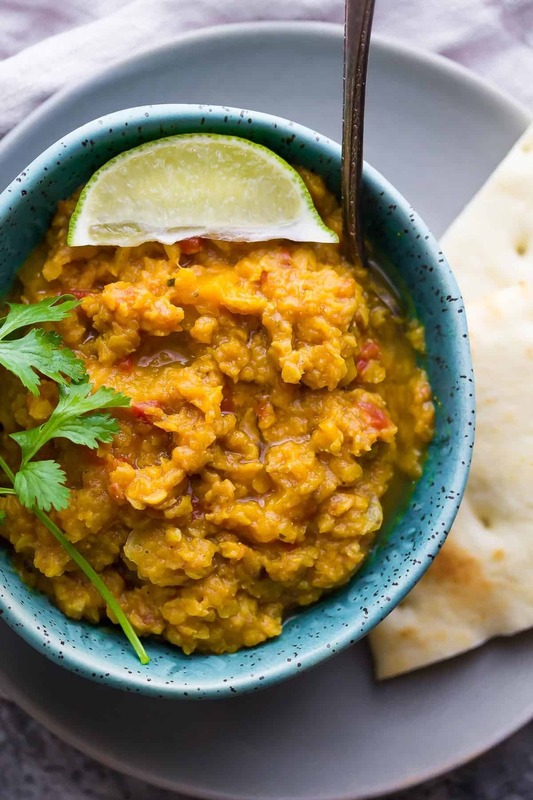 I’m eating a bowl of the Butternut Squash Lentil Curry as I write this- it’s SO delicious and easy! I meant to soak the lentils after reading reviews but that slipped my mind this morning. I’ve never cooked lentils before and so far so good! My butternut squash cubes (purchased pre cubed) still had to mash at the 8 hour mark but no biggie. Only thing I’d change is to add more of a kick to it. Denise, any recommendations? Thanks for another great recipe- I’ll be looking forward to lunch this week! Hi Veronica! So glad you are enjoying! If you want to add some spice you could stir in some sriracha or add some cayenne to taste. Not sure if I can add any more feedback or sing any more praises. This is my new favorite dish. Thank you so much. I recently transitioned to a vegetarian diet and oh my this hits the spot. I am so happy to hear this! Thank you so much, Kate! I made this yesterday and was totally delicious! I put it in on high for 4 hours, was more like 4 and a half and had the same problem as a few others with the red lentils being crunchy. (everything else was cooked perfect) I think I will do the low for 8 hours next time or soak the lentils first. I like the lentils to be mushy! But tasted fantastic! Will definitely be making again!! I ate two servings and froze the rest. Very much looking forward to digging that out of my freezer at a later date. Hi Emma! Thanks so much for your feedback. I have tested and retested this recipe and have never had this crunchy lentil issue…but yes, adjusting the cook time could definitely be the reason you had crunchy lentils. Made this with sweet potato as squash season seems to have long gone. Turned out fantastic all the same! Perfect for a cold foggy Seattle week. Thank you for the recipe! So glad you enjoyed! Good to know it works with sweet potatoes as well! I’m so happy to hear that! Thanks so much for your review, Kathy! Can it cook for less for less than 8 hours with a good result? You could try cooking it on a higher setting and checking on it, but I have only tried it on low. I do believe some people have cooked this in an Instant Pot if that’s an option for you? AMAZING. Easy, so much flavor, and tastes even better as leftovers. Thanks for such a great recipe! So happy you enjoyed! Thanks so much for your review! I just made this in an Instant Pot. Thrown in all ingredients in the pot. Gve it a good sti. Set the pot 12 minutes on manual with 15 minute natural release. Voila! It’s done. Gove it another good stir and serve it up! Glad to hear it works in the IP! I have to try it! I’m planning to make this as my first slow cooker meal, but only have a 3.5liter size. Do you think this will still fit? Hi Aleca! I would cut the recipe in half and cook for the same amount of time. Hope you enjoy! I was thinking of cooking the lentils, then mixing in the soup with the spices and simmering a while to let everything blend. Not sure about adding the coconut milk though, because I don’t really want it to be too runny. Hmmm…not totally sure. I can’t really say without re-testing. I hope it works for you! This recipe look very good but I don’t have a slow cooker. What is the length of time for stove top version. Thanks for your quick reply. Hi June! I haven’t tried this on the stove top, but I would just simmer until the butternut and lentils are cooked through…shouldn’t take long, maybe 30-45 minutes? Let me know if you give it a try! Put it in an oven proof lidded container on 270, in the oven, for 8 hours. That’s all a slow cooker does. Do you think I could substitute the coconut milk for normal milk or low fat yoghurt as I’m watching the fat content of foods so can’t havd coconut milk? Hi Rachel! I think that might work? I would add it at the end of cooking. If you try it, I’d love to hear how it turns out! 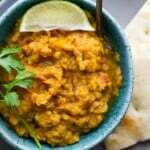 Are red lentils same as masoor dal? We got some butternut squash in our CSA box, and it was finally the impetus to try this one. We doubled the spices, and cooked for four hours on high in the crock pot. It is SO good, and definitely going into our regular rotation. Thank you! LOVED this. Fixed it for 4 adults who are not vegan and they all raved about it. I will definitely fix this again. 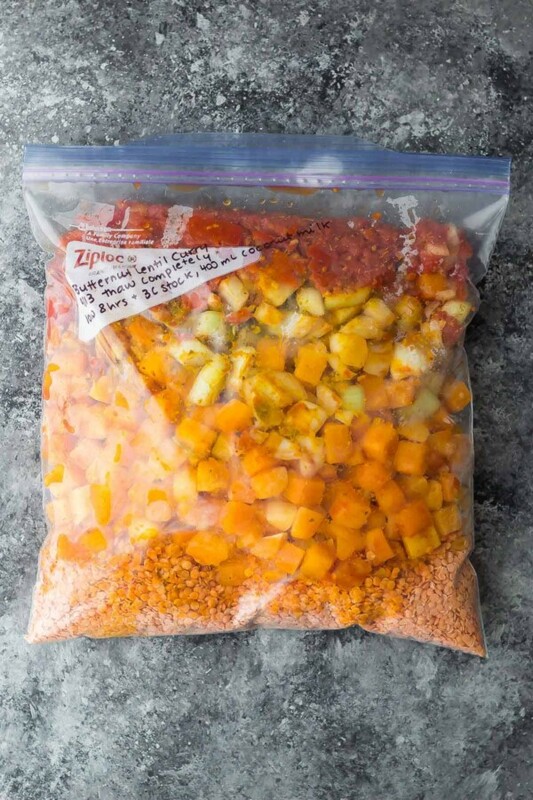 Grew lots of butternut squash this year, so plan to freeze some if I don’t use it all up in repeating this recipe before then. I also found the red lentils crunchy the other two times I made it so this time I soaked the lentils for about a half hour in cold water and then drained and added and they were fine. This is so strange about the lentils. Going to retest. Thanks so much for your review, Joanne! Looking forward to trying this recipe! I’m cooking for two, can this recipe be frozen after it is cooked? Thanks! Hi Angela! We love freezing this recipe! You can freeze the whole batch or portion it out with some rice for easy lunches. Not sure what went wrong but like some of the others,, mine had the same problems. I used red lentils and they somewhat had a bite to it and although it smelled wonderful the end result lacked flavour and had more liquid than I would have liked.I’ll make this again but next time I’ll salt the lentils, use cup less of liquid and add spices at the last two hrs. Hi Mina, apologies for my late reply, I’ve just returned from holidays! I’m sorry to hear you had issues, but also so puzzled! Did you use red lentils? I can’t imaging red lentils not being cooked through after so long. I have made this recipe so many times but I will have to try it again in my new slow cooker. Hi. Loved this recipe. My husband and sons don’t like butternut squash or meals without meat but they loved this. I did increase the amount of spices as one of the reviewers said they were disappointed with the flavour. It turned out perfect. Will definitely be making this again. Thanks so much. Hi Lynne! Thanks so much for your review. So happy you enjoyed it! Made this yesterday and looks and smells great. The lentils still have a bite is that the right texture? Usually my lentils go a bit mushy not sure if that’s how they’re meant to be in this dish? Hi Michael! Did you use red lentils? They should not be chewy at all after that long in the slow cooker. Hi! Do you think this would work with brown lentils? Thanks! Hi Holly! I have never tried brown lentils with this recipe. Let me know if you give it a try! Tried it with brown lentils. It worked well. I ended up adding a little more garam masala, some cilantro and Indian red chili powder after tasting it, but that was a personal preference. Forgot to add that I used a 15 oz can of diced tomatoes, since I was unable to find a 19 oz can in the USA. Wow! Loved it! So easy and so yummy! Will make this again and again! So happy to find such a simple recipe and see so much goodness going into my slow cooker… I shall await the result in 6hrs! I’ve made this twice now and love it! The first time I made it in the slow cooker, and the second time I tried it in the Instant Pot. In both cases, I sauteed the onions and garlic first. In the Instant Pot, I sauteed right in the pot and then pressure cooked the full mixture for about 20 minutes, but it could have used another 2-5 minutes. Definitely part of my weekday lunch prep rotation! Thanks for including your Instant Pot directions, this has been on my list to adapt to the IP! So happy you’ve enjoyed them. They freeze really well, too! Love the photos and this recipe looks amazing! Can’t wait to try?. Hi. I made this and loved it. I don’t know though if it was exactly the same as yours as had to guess the American cup size for my England kitchen. Did try to google cup to gram conversion but the weights were different depending on what you were putting in the cup! In the end I put in a full butternut squash and half a bag of lentils And it tasted great. Have you tried using low fat coconut cream? Just wondering if it works. Hi Gemma! I haven’t tried with coconut cream. I have used lite coconut milk in some slow cooker recipes, but find that it is prone to breaking. This recipe should be fine to add it in at the end though. Do you put the lentils in while they are still raw? Or are they cooked first? I ask because in the past, I’ve had trouble with lentils not cooking properly when they were mixed with canned tomatoes (because of the acid, maybe?). I made this last week. It smelled so good all day while it was cooking. But when we ate, the curry wasn’t nearly as flavorful as it had smelled as it was cooking. Any suggestions? Hi Peggy! I would suggest adding a squeeze of lime and adjusting the salt after cooking. Sometimes slow cookers dilute out the flavors a bit after cooking so long. I was actually going to update the recipe card with these instructions. Thanks for the reminder! This was yummy… I had no coconut milk so use regular milk and I’m sure that affected the flavor but it was still tasty! I made it in my instant pot… 25 minutes then NPR, delicious! Made this yesterday – apart from adding more salt at the end, using fresh instead of canned tomatoes (was out) and adding a minced jalopeño for a bit more heat, I followed the recipe exactly. Maybe the fresh tomatoes produced more liquid, but I had to let it boil on high with the lid off for a while to let some of the liquid evaporate. Was really good and hearty and with Basmati rice and Nan bread the perfect dinner for a FREEZING and snowy winter evening. Having it for lunch again as I type this. YUM! Yay! Glad you enjoyed it! I’ve been freezing it with some rice in meal prep containers and it makes for a great lunch…I think the flavors get better as it sits, too. Thanks for your comment, Christina! Having this for dinner, very tasty! I think this is the first time I’ve made curry at home that actually tastes like curry, so I will definitely be using this recipe again and trying different additions. I think eggplant instead of squash, and adding chickpeas and/or cauliflower would be great. I did a couple of small modifications based on what I had; chicken stock instead of vegetable, green lentils instead of red, and added some tomato paste to make up for a smaller can of divorced tomatoes. Needed a bit more salt but otherwise I thought the spice levels were perfect. I used my immersion blender to make it a bit creamer. Also I think next time I’ll add the coconut cream at the end so it doesn’t separate as much. So glad you enjoyed it, Ellie! I thought it needed more salt the last time I tried it. I will update the recipe 🙂 Thanks for reporting back! I used acorn squash, and Chickpea lentils… Yummy! Trying to figure out how many servings it makes though as I’m tracking my food. Any thoughts on serving size for your nutritional information? Not sure on the exact serving size but this recipe makes 8 portions. Hope that helps! Hi there! Can I cook this in the slow cooker on high for a shorter amount of time? Thank you! How did you cut up the squash? Do you peel it? Those things are tough to cut and it’s raw- correct? Is that something you buy? Is there an ” easy” way to peel and cut? I’m making this recipe now and my house smells so good! I’ve been waiting for butternut squash to come back into season so could finally mak it. I have a question, it’s been in the slow cooker for 7.5 hours and the butternut squash is still in cubes. Do I need to mash it up, raise the heat or maybe leave it in longer? Thanks! Hi Kellye! I’m surprised your butternut is still in cubes. I’d mash it in, personally 🙂 Hope you enjoy! This recipe was so tasty. I added some chopped spinach at the end of he cooking time. So delicious. This recipe will become a regular dish for me. It was so easy too. Thanks so much for the great recipe. I can’t wait to try this recipe!! I just can’t seem to find a 19 oz can of coconut milk or tomatoes…. is it supposed to be one 9 oz can?? Sorry so confused!! Your trip to Nepal looked amazing! My husband and I plan on going next year! Hi Niki, I’m in Canada so it’s possible we have different sized cans here? I often use Aylmer brand, which comes in 540mL cans. As for the coconut milk that appears to be a typo, I use 400mL Thai kitchen brand cans. So that should say 13.5 I will update the recipe asap 🙂 I hope you enjoy Nepal! I’m sure it has changed a lot since I visited but I would love to go back one day. I also can only find 400 gram tomato cube cans (14.5oz). Is that about the same as your size can? Or should I use 1 and a half can? I am from the Netherlands and the weather is turning to fall here finally. This will be the perfect comfort food with naan or maybe some couscous. HI Sabine, so sorry I seem to have missed your question! I think 14.5 oz should be just fine. Hope you enjoy! I made it this weekend, and highly recommend it! Added a sweet potato, and cut back on the amount of lentils. I also used more spice than the recipe called for because I love the flavours (1 tsp where it notes 3/4 tsp). Finally, I added the coconut milk during the last 30 minutes of cooking as it tends to separate if cooked for much longer. Followed this exact recipe and it turned out so good! Love the way the butternut squash melts in and creates a creamy goodness. Even better the second day! Wow – Nepal at 15 – that’s pretty amazing. What a wonderful trip that you’ll remember for your whole life. Love the balance of earthiness and sweet with the lentils and butternut squash – this is my idea of comfort food served over a big bowl of rice – perfect for a cold day, Denise! That is such a crazy awesome opportunity! I went a few places when I was in high school, but never that far and never for that long! This is the perfect twist on a classic (and it’s made in the slow cooker!)! I saw a few of your photos you posted on social media from your trip to Nepal, so it is really cool to come here today and read more about your trip!! I can’t imagine getting the chance to visit another country without my parents at such a young age, but it is amazing that your parents were so trusting! Seriously, talk about the trip of a lifetime! Anyways, I am seriously swooning over this curry! The flavors sound awesome and I LOVE that you used b.squash (my favs!)! This looks just perfect, girlfriend!! Cheers! What an incredible experience! That is awesome that you had the opportunity to go to Nepal! And I LOVE these photos and this curry! It looks and sounds SO flavorful and delicious! YUM! And love these photos! What an amazing trip that sounds like! So awesome that you got to have that experience. 🙂 And oh man, curry is totally my LOVE language so this gorgeous dish is calling my name! Love all that butternut squash goodness! That trip to Nepal does sound like the trip of a lifetime, and I love the photos you shared! This looks like a great slow cooker twist on a classic dish and I know I would love this!